As American medicine grows ever more complex, a basic of care is getting risky short shrift: Hospitals may be failing to protect their patients’ safety by ensuring they are clearly identified and their medical records don’t get mixed up. The Wall Street Journal provides a list of horror stories about wrong patient IDs and record mix-ups. These were detailed in a “deep dive” by the ECRI Institute, a nonprofit patient safety research group that studied more than 7,600 reported “wrong patient errors” at more than 181 health care organizations between January 2013 and July 2015. The mistakes, shared under a law that allows their reporting to federal authorities without liability, likely were only a fraction of the many more that occurred. ECRI found that: clinicians failed to resuscitate a patient in cardiac arrest because they mistook him for another patient who had a do-not revive order in his chart; a patient who was not supposed to fed, due to a mix-up, got a meal tray and choked; an infant, confused for another, got the wrong mother’s milk and was infected with hepatitis. Although researchers found that most of the ID errors were discovered and fixed before patients were harmed, most were altogether avoidable: too many mix-ups occurred in admissions, because electronic systems mash up or fail to distinguish between duplicate records and patients with similar names (Joe Smith, Joe E. Smith, and Joey Smith). Test and procedure problems cropped up because patient wristbands had fallen off or were illegible. Records too often fail to prominently display a photograph of a patient. 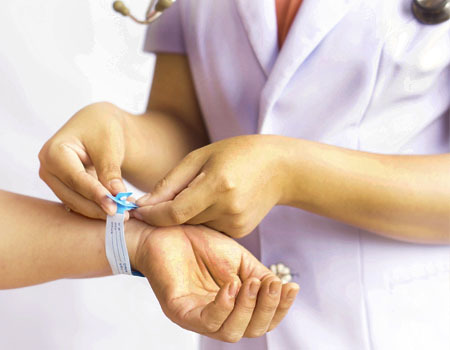 Caregivers don’t always adhere to protocols requiring them to match bar codes on patients’ wrist bands, records, and medications. Families and loved ones are insufficiently consulted and involved, so they could alert caregivers about ID and records mix-ups. I’ve written about the importance of patients having easy, affordable access to their own medical records, and recent federal regulatory efforts to assist this process. But I’m certain no one expects that the seriously ill would need to cart these materials around themselves in hospitals. Harried caregivers need to be reminded that identifying their patients and ensuring they’re getting the proper care is fundamental−and if hospitals and their staff deliver negligence instead, lawsuits may provide some measure of justice if patients are harmed. But wouldn’t it be better to prevent these errors in the first place?